You actually hear this question more often than you think you would, with it usually followed closely by the followup question if everyone should get naked and huddle for warmth as an effective warming secondary strategy. When you are camping in cold weather, is it actually warmer to sleep naked than to sleep with your clothes on? The short answer to this is only if the only clothes you have are damp or wet, if not, then probably not. Each person is slightly different and your exact conditions will be different, but unless you are an experienced camper, just go to sleep dressed in dry layers. If you are anything like me, you will have to pee at least one time in the middle of the night. Trying to put all your clothes back on without leaving the warmth of your sleeping bag makes sleeping naked almost not worth it just for that reason. One common mistake is placing your dry clothes next to your wet clothes within your backpack. In no time at all, your dry clothes are now your damp clothes. There are exceptions to everything though. If you are doing high altitude camping with a really good sleeping bag, then you could actually be better off sleeping naked. Coleman has become the premier brand when it comes to camping gear and outdoor recreation gear and equipment of all types. The Coleman sleeping bags are some of the most highly sought after products of their kind on the market today, including the winter sleeping bags . Perhaps you are considering the purchase of a Coleman Hibernation sleeping bag. Towards that end, you may want some basic and essential information about the Coleman Hibernation sleeping bag before you do make a decision, before you make purchase. There are in fact a number of features associated with this sleeping bag that are unique to Coleman. You simply cannot find these features on any other sleeping bag that is on the market today. Indeed, it is precisely these unique and incomparable features that continue to draw a significant percentage of the market towards buying Coleman products time and time again. The Coleman Hibernation sleeping bag is roomy. It measures 66” by 75” and is designed to sleep two people comfortably. The Coleman Hibernation sleeping bag comes complete with a cotton cotton cover as well as a soft cotton flannel liner. The comfort level of this sleeping bag has been described as beyond compare by innumerable people who have had occasion to use this sleeping bag. It also gets high marks from independent consumer evaluation organizations. With the Coleman Hibernation sleeping bag, you can keep comfortable at temperatures down to forty degrees. It is filled with six pounds of Coleman’s exclusive and industry market leading Hollofil 880 fill. The sleeping bag as a handy exterior pocket. The sleeping bag easily can be laundered in a commercial washing machine and dryer. It stows readily for easy storage. When many an adult is asked to think back and reflect upon memories of childhood, upon memories of youth, in many instances that trip back through the years ends up at a long ago camping gear trip or other type of out of doors adventure. Perhaps you’ve reached the juncture in your own adult like that you would like to plan and take off on a camping trip with your own family, children included. In this regard, you will need to make some important decisions regarding the type of child sleeping bag or youth sleeping bag that you will want to purchase for your children. When it does comes to kid sleeping bag options, there are a surprising number of factors that you will want to take into consideration before you make buy anyone of the various youth sleeping bag products that are available on the market today. Historically, if you are a person who enjoys outdoor recreational activities including camping gear and similar pursuits the year around, you oftentimes may have found yourself by duplicate products depending on the time of the year. By this it is meant that you were forced to make seasonal purchases of gear and equipment that ended up being expensive. In point of fact, many people just like you were compelled by necessity to purchase different camping sleeping bags – warm weather sleeping bags and wintertime products as well. The reality is that there are now some very solid lightweight sleeping bag options that you will want to consider purchasing and making a part of your year around outdoor activity gear and equipment supply. By taking the time to shop around, you actually will be able to find some good deals from a financial perspective on different lightweight 4 season sleeping bag products. In some instances, these types of sleeping bags really do offer the biggest bang for the money spent. Because they can be used the year around, you do not have to worry about spending money on more than sleeping bag if you are the kind of person who enjoys outdoor activities all year long. The lightweight 4 season sleeping bag is the perfect choice when it comes to sticking to your budget and keeping your finances in order. It leaves you money available to purchase another gear or equipment item that you may long have had your eye on but did not feel you had the extra money to purchase. The Coleman Mummy Sleeping Bag: Is It Right for You? Shopping around for the right camping sleeping bag can be a challenging task. In the 21st century there are so many different brands on the market that the whole process of finding the right sleeping bag can be very confusing. With this understood, Coleman is a company that has a sterling reputation when it comes to camping gear, including sleeping bags. In this regard, as you consider which sleeping bag to purchase, take a look at the benefits that can be realized through owning and using a mummy sleeping bag. The reality is that the Coleman mummy sleeping bag is one of the most highly regarded sleeping bag products on the market today. The Coleman mummy sleeping bag gets high marks in each of these areas when it is compared with other brands of sleeping bags that are being offered on the market today. As you prepare for a camping gear, backpacking or some other type of outdoor adventure, you need to make certain that you are indeed fully … prepared. In the end, preparation is the key to a safe, successful and enjoyable outdoor experience. In this regard, one set of steps that you will want to take are those associated with protecting sleeping bag from moisture. Indeed, this article as been prepared to provide you with some basic tips for protecting camping sleeping bag from moisture. By following this tips you will be working to ensure that your own trip is not made miserable by a damp and dank sleeping bag. Again, you will be taking steps to ensure the best possible recreational experience imaginable. One of the moat fundamental steps that you can and should take when it comes to protecting sleeping bag from moisture is the purchase of a good quality sleeping bag liner. The fact is that no matter how careful you are when camping, the elements simply have a way of sneaking up on you. Before you know it, in the absence of a quality sleeping bag liner you can end up with an unpleasant – wet – sleeping bag. When you are shopping around for a sleeping bag, make it a point to purchase a suitable, companion sleeping bag liner at the same time. Of course, you will spend a bid more money in the process. However, it will be a worthwhile investment in both the short and in the long term. Many people, when camping, tend to leave their gear lying about – particularly if they are using tents. The reality is that even when a tent is being used, there is a risk that sleeping bags and other cloth items can become damp in no time at all. Therefore, when it comes to protecting sleeping bag from moisture, it is always advisable to stow your sleeping bag away when it is not in use. Of course, before you stow your sleeping bag, you will want to make certain that it is dry and not damp. Stowing a sleeping bag that is damp, without permitting it to dry out, can have even worse consequences for you. In the end, although stowing your gear will take a small amount of time, you will be glad that you took the time to put away things like your sleeping bag when it comes time to use this gear again. If you are in need of a sleeping bag, you may be wondering where you can turn to find the best possible deal on a down sleeping bag sale . In fact, in this day and age, there are a number of different options available to you when it comes to finding the best possible deal on a sleeping bag sale. By taking the time to shop and around and consider your options, you will be able to find an ideal sleeping bag at a price within your budget. There are a number of tips that you should keep in mind before you set off in search of just the right place to find the perfect sleeping bag for sale. First of all, before you head out shopping, set the budget for your sleeping bag. Do not take off on a shopping trip before you have established your own personal budget, without first delineating how much you want to spend on a sleeping bag. If you do not set forth your own budget in advance, you can very easily end up spending more on a sleeping bag than you wanted to – and than is necessary. Second, before you begin to actually begin searching for a sleeping bag, take the time to actually create a list of how and when you will be using your sleeping bag. For example, if you will use your sleeping bag only in a warmer climate during the summer months for camping that is very different than using a sleeping back for mountain climbing in the wintertime. Finally, get advice from friends, family members, colleagues and other outdoor enthusiasts about their own sleeping bag purchases. Find out what types of sleeping bags they have purchased and where the went when they were searching for sleeping bags for sale. As you go about the process of shopping around for a sleeping bag, you likely have found yourself debating the pros and cons of down versus best synthetic sleeping bag. The reality is that there are benefits to be realized through down sleeping bags and there are positive elements associated with synthetic sleeping bags. Through this article, you are provided with an overview of down and synthetic sleeping bags to assist you in selecting the sleeping bag that is right for you. Of course, when it comes to selecting a sleeping bag, comfort is a prime issue. Down sleeping bags have garnered fans because – as with other down products – they are comfortable. 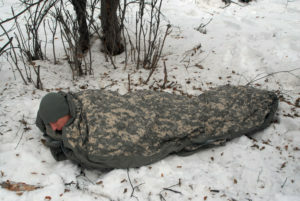 Many people initially shied away from synthetic sleeping bags because they worried that they would not be as comfortable as their down counterparts. The reality is that modern day synthetic sleeping bags rival down products in terms of comfort. Moreover, synthetic sleeping bags have proven to be strikingly effective at controlling moisture related issues … they tend to stay drier easier than some down products. Over the course of the past fifteen years a growing number of people have taken up wintertime outdoor recreational activities that involve making overnight stays in the out of doors. This includes everything from wintertime camping to backpacking and a host of other outdoor activities in between. If you are interested in taking up these types of wintertime activities, it is very important that you identify, purchase and use the most appropriate winter sleeping bag. As you go about the process of trying to find the most suitable winter sleeping bag, there are some pointers that you need to keep in mind. By paying heed to these tips, you will be able to find the most suitable winter sleeping bag for your particular purposes and needs.